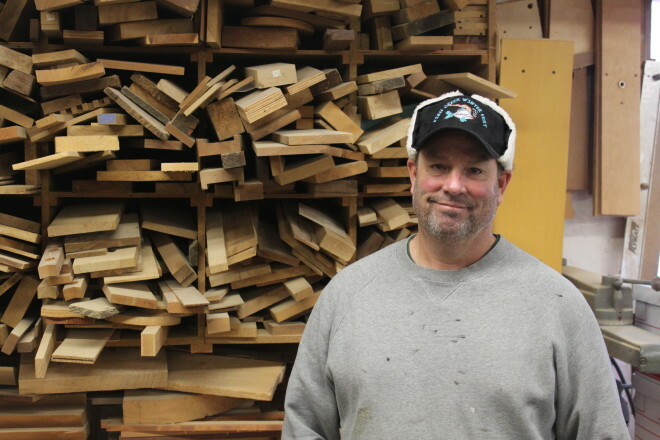 Bob Spielman in his woodworking shop days before Fish Creek Winter Festival 2016. Submitted. 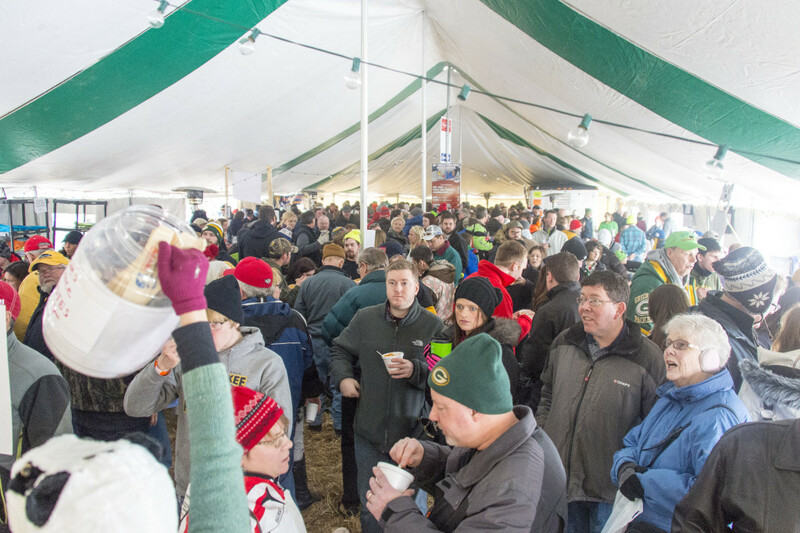 It’s about 48 hours before Winter Festival kicks off in Fish Creek and organizer Bob Spielman is wondering how to get the Happy Schnapps Combo van to the stage amidst the beer-drinking bowlers in the main tent. 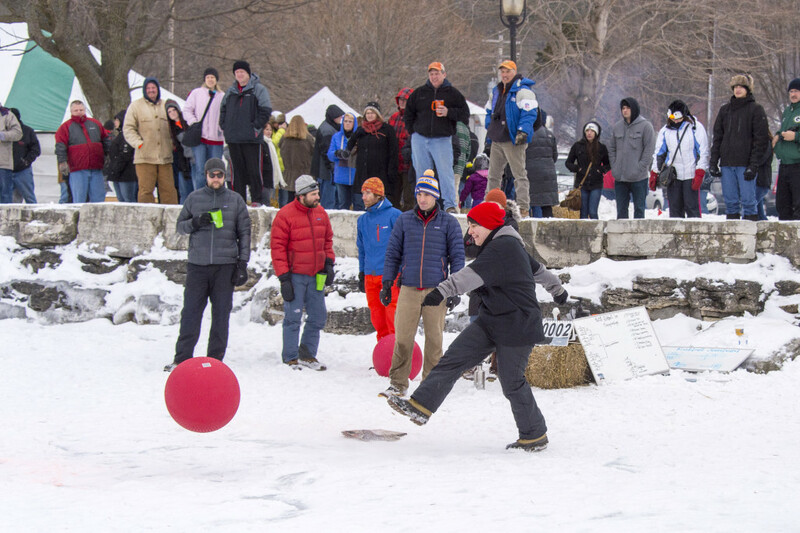 The Fish Creek Winter Festival kicks off on Friday, Feb. 5, with the main events on Saturday. Admitting the festival relies more on its quirks than on its spectacles, Spielman has watched the weekend evolve over 29 years. Inside the Winter Fest tent. Photo by Len Villano. Those were the early days when ice was more reliable and the Fish Creek Civic Association was looking for ways to fundraise for their year-round events. And it worked. The festival brought in enough money to fund the association’s year-round activities. But a few years later, room tax puffed up the association’s bank account even more. Soon, that volunteer base that was there to help the association make some money faded away. 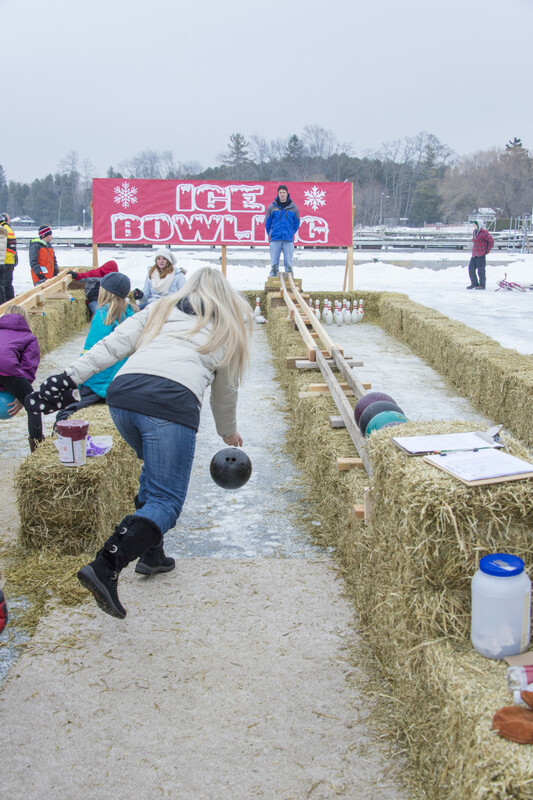 Ice bowling at Winter Fest. Photo by Len Villano. In the late 1990s, what was formerly known as Winter Games became Winter Festival when the association tried expanding the event throughout town. Local businesses would each host one of the games, as far away as the Cherry Pit Spit at Lautenbach’s Orchard Country Winery. Two years after residents and visitors sounded off on the town-wide festival, the association brought it back under one canvas roof. It was right around this time that Spielman really got involved. But volunteerism was still an issue and the group needed a way to bring people in not just for the party, but to help with the event itself. Minnow races inside the tent at Winter Fest. Photo by Len Villano. “I came up with the idea of offering these different game stations to local nonprofit organizations like the YMCA, the Children’s Center, the booster clubs, the snowmobile club. Gibraltar Historical Association, those are a few,” said Spielman. Since the Civic Association didn’t really need the money, the deal was that nonprofits could be in charge of a game and keep the money they made. Still, attracting the nonprofits was a slow process and only when the Sevastopol Booster Club came on did things pick up. With nonprofits managing most of the games, the Civic Association can turn to a broader goal of attracting people to visit Fish Creek. Even though many business owners who are members of the Fish Creek Civic Association close their doors for the winter, they still support the festival and what it does for Fish Creek. It attracts a different kind of visitor to see the county in a different way, away from big boats and busy streets. The Winter Fest Kickball Tournament. Photo by Len Villano. But Spielman is also happy with the amount of locals he sees under the tent during the weekend. So the Wednesday before the big weekend, Spielman heads down the hill from his workshop to check in on the nonprofits. He looks at how many teams are signed up for the kickball tournament. He will grab a couple hours of “not very good” sleep and then the tent shows up at Clark Park. Then it’s the beer. Then it’s the people. 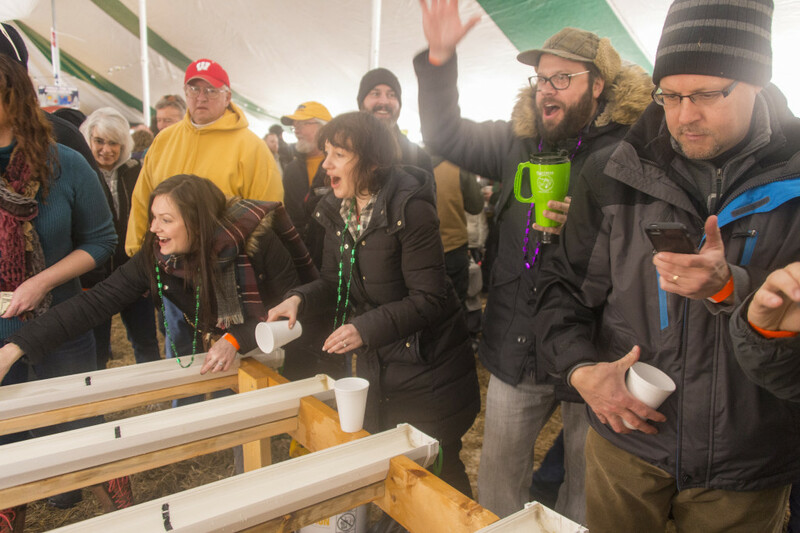 Some are from out of town but most are from right here in Door County, ready to celebrate nothing but a weekend between friends and some of the strangest games that the wacky minds of Fish Creek envisioned 30 years ago.